Brake Hoses Kit 3 Frentubo HARLEY DAVIDSON 1450 SOFTAIL STANDARD 99/01. Number of Hoses in the Package: 2. 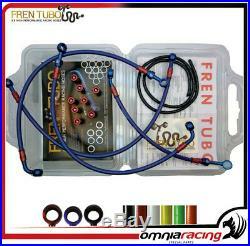 Brake Hoses Kit aereonautical for motorcycle Frentubo Type 3. The kit is complete with Kevlar reinforced teflon tube with standard blue sheath, standard ergal fittings and pins (unless specified otherwise). The Brake Tube Kit is complete with all ergal bolt bolts and fitting accessories, and includes both Aluminum Front Tubes and Fittings, and Rear Seals, always complete with fittings, bolts and gaskets. The Fren Tubo Kit eliminates the annoying « lung » effect during motor braking, thus improving the power and sensitivity of the front and rear brakes. Aircraft brake tubes considerably improve the braking system of the bike. Designed for racing specific racing use in Superbike, Supersport, Moto 2, Moto3 and MotoGP , this type of piping has a remarkable yield and are an important change to be made to any kind of motorcycle brakes. The kit type 3 thanks to the light alloy joints and reinforcement in kevlar instead of steel saves weight and gives the bike a racing look by real racing. The kits are specifically designed for the original bike shown, so assembly does not require any modification, all are TUV and DOT certificates. They are all plug & play specific for each brand / model / year of motorcycle. The package includes the necessary mounting and, where necessary, installation instructions. The hose may be required coated in the following colors. Fittings can be in the following colors. Specifications for TYPE 3 kit. Kevlar tube with external sheath and fittings made of anodized aluminum alloy. Conforms to FMVSS 106 standards. Minimum burst pressure: 827 bar. In the case of racing Brembo or Accademed aftermarket racing pumps, it is necessary to be indicated in order notesWe recommend that you always use brake fluid type Dot 4 compatible with all brake pumps, and above all of the excellent brands of the Brembo, Castrol, Motul type, taken from a sealed bottle. We do not recommend using Dot 5 or Dot 5.1 oils as they are perfectly compatible with Frentubo but they are not compatible with the gaskets of most brake pumps. Brake / Clutch Kit Tubes no « Standard », with custom colorings, are made exclusively for the customer, this is a customization, so it is not possible to replace them even to render them. The tubes are a safety device and can only be installed by qualified personnel. In 1994, the Passion and Experience of Fabrizio Bertollini created OMNIA RACING , with the aim of representing a reference point for everyone fond of bikes. In 2000, when Salvatore Orefice joins OMNIA RACING , the OMNIA RACING Special Parts project is founded, a society based on the passion and competence needed to create and trade the top products for motorbikes. Our continuous search for perfection and performance, using advanced technologies, has allowed OMNIA RACING Special Parts to interact with internationally famous pilots and teams. Our products are excellent for both road and circuit use. They are constantly tested by our technicians and pilots, thus improving the techicnal, dynamical and structurale features of the materials adopted and of the special parts produced. The experience gained through the years has permitted Omnia Racing Special Parts to be extremely selective in the choice of the firms and of the products distributed. Accostato, Afam, Aim, Akrapovic, Andreani, Arrow, Bazzaz, BC battery controller, Bitubo, BMC, Braking, Brembo, BST, Capit, Castrol, Derry Moto, Diapason, DID, Discacciati, Eibach, EK, Fabbri, Far, FrenTubo, Galfer, GBRacing, Giannelli, Gifrap, Givi, Gopro Hero, GPT, H2O, Hagon, Ixil, JollyMoto, Kappa, Laser, LCR selle, Leovince, Lightech, Mafra, Marchesini, Marvic, Marzocchi, Matris, Mivv, MRA, Nissin, Ohlins, PBR, Polini, PT, Rizoma, RME, Robby Moto, Sachs, STM, Stomp, SuperB, Suter, Termignoni, Valtermoto. OMNIA RACING Special Parts is in close contact with its customers, taking part to several important events: Bike Expò Padova, national and international races, free circuit sessions. On the web, our « on-line shop window » is always associated with a direct contact with the customers, so as to suggest them the product that best suits their needs. This should allow our customers to feel at ease and to trust us. All this has allowed us to become, in less than a decade, a reference point in Italy; in addition, our products are increasingly demanded also in Europe and in the US. L’item « Kit tuyaux frein 3 Frentubo HARLEY DAVIDSON 1450 SOFTAIL STANDARD 99/01″ est en vente depuis le mercredi 7 février 2018. Il est dans la catégorie « Auto, moto pièces, accessoires\Moto\ pièces détachées\Freins, suspension\Conduites de frein, tuyaux ». Le vendeur est « omnia-racing » et est localisé à/en IT. Cet article peut être livré partout dans le monde.